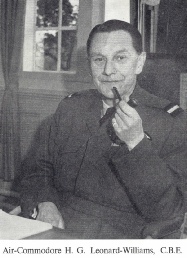 Air-Commodore H. G. LEONARD-WILLIAMS. C.B.E. The Command of RA. F. Locking has been up-graded to air officer rank, and Group Capt. Chamberlain's successor at Locking is Air Commodore Harold Guy Leonard-Williams, who has come from the Air Ministry. This is the first time he has been to Weston, but he knows other parts of Somerset quite well. Air Commodore Leonard- Williams was born at Winchester and educated at Lancing College. In 1930 he went as a cadet to the R. A. F. College at Cranwell, and after completing his studies, he did a three-year tour in the Middle East, returning to this country in 1936. He then went back to Cranwell for a signals course. Afterwards, he became an instructor at Cranwell College. During the first year of the 1939-45 War he served in France and, for the remainder of the war, was at the Air Ministry. He then carried out another tour of the Middle East, lasting for nearly three years and, on his return joined the Joint Services Staff College at Latimer. He then went to command the Radio Engineering Unit at Henlow. Following this appointment he became a Deputy Director of Signals at the Air Ministry. Later, he was appointed to the Headquarters, 90 Signals Group, and then returned to the Air Ministry as Director of Signals where he has spent the last two years.